Glenn's Texas History Blog - PLEASE HELP GODE! I can now post photos on the blog. My friend Billy Ray sent me the following photo. 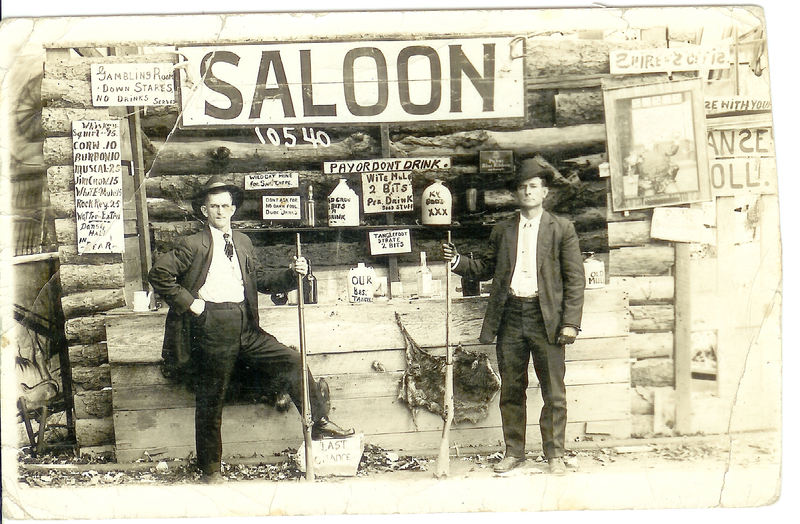 Its not Texas but a picture of Sheriff Hugh Porter (right) made in 1915 at the Log Saloon in Douglas, Arizona. Thanks Billy Roy! Also thanks to my web wizard Mike Middleton. I am Jim Willeford, Glenn Willeford is my father. If we met years earlier, I hope you will forgive me for not remembering. Regardless, I have read your Porvenir article over and again; I find it and the accompanying photos fascinating. I first read of the Porvenir Massacre in Robert Keil's book, Bosque Bonito. It captured my imagination and has occupied my thoughts for years since. It was gratifying to hear from Dad that you and he had done some excavating, found some bullets and cartridge casings, and were able to gather information on what may have actually happened at the site. Based on your findings, it appears that Keil's account of who did the killing may have been more than a little biased. As you know, he blames the killing on two unidentified Texas Rangers (who allegedly thereafter fled the area and were never seen again), leaving the shocked and horrified troops behind to clean up the mess and deal with the aftermath. That the evidence implicates the troop of US cavalry itself to have been actively involved in the massacre elevates it to a horrific, bloody travesty. What a helpless situation for the victims, what a despicable action for the murderers, and what terrible memories and devastation for the survivors. Keil recounts in his book a horseback return to Porvenir later in his life, decades removed from the incident. According to his account, the horse he was riding absolutely refused to go near the massacre site. Why? Perhaps the spirits of those victims recognized a participant from so long ago, and were roused by his presence? Who knows. However, this one significant event, perhaps the only event of consequence in the entire history of the spot, may have stamped such an imprint upon the place that it may be forever stained. That the ballistic evidence remained to be discovered, inspected, and so plainly tell a story after nearly a century is as fascinating as any mystery man could invent. There are probably more evidentiary items to be found, waiting patiently in the grit to reveal their secrets. I would love to be a contributor to the Porvenir effort in whatever way I can. I am a career Marine and am not residing in Texas, but if you intend to make another trip to the site, please let me know in advance; I would love to make plans and accompany you. I enjoy visiting your Texas History blog and do so several times per week. Thanks for your efforts, and keep up the good work! Hello everyone.I appreciate the fact that more ballistics have been recently found at the Porvenir Massacre site where I took a crew to film in 2002. I have just re-located the transcript of the main interview that I conducted with Juan Bonilla Flores in 2002 and plan to share it with Glenn, if I can obtain the permission of an expert translator who was involved. I'm also writing The American Lynching Phenomenon, the first definitive work of its kind since James Elbert Cutler's Lynch Law in 1905. (I think an update is somewhat overdue.) I often accept invitations to lecture on lynching-related topics and to show a trailer for the documentary feature project at universities and colleges and other venues for a quite reasonable fee. You can watch me discussing lynching at the University of New Hampshire if you go to the www.americanlynching.com or else google me from the main page of YouTube.com. Your feedback is welcome. My colon closed down for seven months and is now finally permitting me to live productively again! If you have comments or would like to make a donation (even a tiny one) to help us finish production, please email me or call me in Rhode Island at 401-828-4435. Several years ago, documentary filmmaker Gode Davis videotaped an interview with Juan Flores, the last living survivor of the Porvenir massacre. Davis has written and produced a number of films over more than 20 years including The Nature of Biology; Winter: The Saint Paul-Sapporo Connection: The Palestinian Question: and the 1998 film Tunnel Visions described as "succinct and captivating television" by PBS affiliate WGBH-Boston. The Juan Flores interview was to be part of Davis forthcoming film, American Lynching: A Strange and Bitter Fruit. I had the privilege of being present when the Flores filming took place both in Odessa and at Porvenir the following day. Sadly, Mr. Flores passed away in 2007 and never got to see the film completed. I have had many inquiries about the status of the Davis production and recently had the opportunity to visit with Gode about the progress of the film and ask that he release a transcript of the Flores interview so that it can be made public. Gode was very cordial in our conversation and remains committed to getting American Lynching completed although he is facing some very serious health issues. We wish him a speedy recovery. Gode agrees how important the Flores account is and the fact that entire Porvenir massacre story certainly needs to be told. I am of the opinion that the Porvenir massacre and the Flores account is a story that should stand on its own. Hopefully, one day, Mr. Davis will be able to produce a film about the massacre or perhaps focus on abuses along the Texas border during the Mexican revolution years. In addition to his health problems, Gode needs $10,000 more to get American Lynching completed. Hopefully he will be able to raise the money. Anyone wishing to contribute to the effort can contact him at his American Lynching website: http://www.americanlynching.com/. I read your piece on the Porvenir Massacre with great interest. You see my great-grandfather was Federico Villalba (1858-1933) who, at the time of the killings, had a Warrant of Authority from the Texas Rangers. Federico's 20,000 acre Rancho Barras was located in Burro Mesa. When word got back to him about this horrific tragedy, he sent his son, Jorge to investigate. Jorge returned with an account of the atrocity los rinches committed. In protest, Federico immediately resigned his Warrant. I have written a book about my great-grandfather and his family that should be on the shelves in late July/early August. It is titled Federico Villaba's Texas, A Mexican Pioneer's Life in the Big Bend, 2008, Iron Mountain Press. My book also contains the account of his son's, Jacobo and Jorge's involvement in the shooting deaths of Aubrey "Jack", and Winslow Coffman in Study Butte in 1923, and the murder of Jacobo by Delfi "Det" Walker in 1931. Contrary to other published accounts of my great-uncle Jacobo's death, he was not shot by Joe Graham Barnett, a former Texas Ranger. It is true that Det Walker hired Barnett to kill Jacobo, but by Jonce Walker's own admission, Jacobo was killed as a trespasser on the Talley Ranch, though the circumstances and manner of his death are highly disputed. Also, thank you for sharing the pictorial. San Antonio Evening News-Tuesday-August 19, 1919. "American cavalrymen and airplanes crossed the border at Candelaria, Texas this morning at daybreak in pursuit of the Mexican bandits who kidnapped Lieutenants H. G. Peterson and Paul H. Davis, United States aviators, and to whom $15,000 ransom was paid last night before Peterson and Davis were released. Davis and Peterson are guiding the troops." "Maj. Gen. Joseph T. Dickman, commander of the Southern Department, left San Antonio at 1 o'clock today for Eagle Pass, and announced that he would be ready to go to Marfa, the headquarters of the Big Bend district in which Candelaria is located, if his services there are required. So far the movement into Mexico has been solely under the direction of Col. G.T. Langhorne, the commander at Marfa. No announcement had been received by Gen. Dickman that the troops had actually crossed the border when he left for the West." "At General Dickman's office it was announced that nothing would be given out to the newspapers for publication on the movement across the border. From other sources it was learned that the order to go across the line immediately after Peterson and Davis were safe on this side were telegraphed to Col. Langhorne yesterday. Col. Langhorne assembled 200 cavalrymen from close by stations and had several big army trucks ready to make the dash as soon as it was known that Davis and Peterson were in the hands of the American officers." "At General Dickman's office it was said the pursuit of the bandits was being conductd under the plan recently adoped to chase lawbreakers who were successful in getting back across the Mexican border." "While no announcement was made, it was indicated that as soon as the bandits are captured, the cavalry force and airplanes will be withdrawn." "A telegram was recievd at the headquarters of the Southern Department early this morning telling of the release of Peterson and Davis. Peterson was released shortly after midnight and it was about 2 o'clock this morning when Davis arrived at the point where he met the American officer." "As agreed upon by agents of the bandits, Capt. Leonard Matlock, of the 8th Cavalry left Candelaria shortly before midnight and went to a place three or four miles across the border on horseback. He deposited half of the $15,000 ransom, as per the contract and went away. He returned to the spot where he had deposited the money a few minutes later, and Lieut. Peterson was there waiting for him. He and Peterson then rode horseback to where the other American officers and soldiers were waiting." "Capt. Matlock then returned to the same place and shortly after 2 o'clock he galloped back to where the American officers and soldiers were waiting with Lieut. Davis riding behind him on the horse." "One telegram received a the headquarters of the Southern Department stated that Capt. Matlock did not deposit the last $7,500, as he had agreed to do, but that when he found Davis there, he simply pretended to deposit the money and fled from the scene with the rescued man." "Gen. Dickman did not understand this part of the telegram, and telegraphed instructions to Col. Langhorne to wire particulars. At Gen. Dickman's office it was stated if Capt. Matlock had not paid over the last money to the bandits as he had agreed to do, the money would be paid, as the army would not be put in the light of having broken faith even with bandits. This statement was issued while United States soldiers were actually chaising the bandits." "The money paid as ransom was supplied by contributions from cowboys and businessmen around Candelaria. The War Department has instructed Col. Langhorne to notify all those who contributed that they would be reimbursed as soon as the gold car arrive there. The bandits stated in their first communication offering to surrender the men that the money must be in gold coin. They were afraid the acceptance of currency would lead to their identification and arrests." "Peterson and Davis both say that they were well treated, according to a telegram received by Gen. Dickman today. They say they had plenty to eat and were subjected to no indignities." "They both believed they had fallen on the American side of the line, and are yet badly mixed as to their directions. It has been clearly established, according to the American army officers, however, that the plane fell Sunday afternoon near Las Vegas and Cuehlile, Mexico. This is about 35 miles below the border. Then the men wandered down the Conchos River, which was close to the point where they fell until they reached Falomir. They were captured near this place Wednesday after they had been without food or shelter three days and nights." "Peterson and Davis both thought they were captured near Valentine, Texas. They spoke of being taken into the mountains near them. They also spoke of passing near the railroad bridge. There is no bridge near Valentine. The only brindge in theat part of the country is over the Concho River near Falomir and it was decided that they were captured there and taken into the hills west of that place." "The two fliers were kept in the hills until Monday and then started on the way to the place near Candelaria where the bandits had agreed to deliver them upon the payment to the $15,000. They reached that place Monday night shortly after dark." "The airmen told the officers rescuing them that the leader of the bandit gang was a one-legged and one-armed Mexican who said he was educated in the United States and that he had been a railroad man in Kansas. He lost his arm and leg in a wreck in Kansas, he said." "There were about twenty men in the kidnapping party, according to Peterson, but he said the leader of the gang told him he had a bandit force of about sixty men." "The airplane was torn to pieces by the fall Sunday, according to information received here, and the telegram said the machine gun mounted on the pane was put out of commission. The messages received today did not state what happened to the plane to make it fall, but it is believed it was crippled during the violent storm which started soon after the men went out on the trip. If the belief of the army officials here is sustained by later telegrams Peterson and Davis went south while they believed they were going northwest." "This is explained by fliers who say that that frequently a plane may be heading a wind and seeming traveling 75 miles an hour in one direction when it is actually being blown at that speed in another direction." "Lieut. Davis, who was stationed at Kelly Field for some time, was sent from here to the border recently to do radio work. While at Kelly Field, he was engaged in installing radio on the planes. Before being assigned to that work, he was one of the assistant adjutants in the personnel department. He is also well known in San Antonio."